The Ridge Heritage Association met on Tuesday, Feb. 12 at 7:00 p.m. at the Edgefield United Methodist Church Fellowship Hall. Owen Clark, president, presided. He thanked Carolyn Piekielniak for obtaining the video about the rapper 50 Cent and his Edgefield County roots. 50 Cent’s real name is Curtis Jackson. He is a rapper, writer, actor, and a film producer. He came to Edgefield County last year to search for his family. His stops, as shown on the video, were Oakley Park, the Edgefield County Archives, and a visit with relatives in Johnston. Plans were made for memorials to two recently deceased members of the Association. They were Kitty Knowles of Edgefield and Aileen Tiller of Johnston. Owen announced that a series of one-minute scripts on the history of the Ridge are now being broadcast on Radio Station WKSX, 92.7 FM. Owen and Carol Bryan have written the scripts, and several will be aired each week for a total of eight months. At the end of the meeting, the members enjoyed finger foods. Edgefield County has been known for two centuries as the home of many political luminaries and renowned individuals. More recently, one of the Nation’s outstanding citizens has traced his roots here. It is now known that rapper artist Curtis James Jackson, III, also known as “50 Cent” to the music industry, is directly linked to Edgefield and Johnston. David Kamp, a writer contributing editor for Vanity Fair magazine has teamed up with VH1 Television to do a special on 50 Cent’s genealogy in an attempt to interest viewers in the ancestry of popular black entertainers. Their journey begins right here in Edgefield tracing the roots of Curtis “50 Cent” Jackson. 50 Cent’s maternal grandparents, Curtis and Beulah (Jenkins) Jackson, lived in Edgefield until the 1950s, before establishing their home in Jamaica Queens, New York. Their daughter Sabrina Jackson, mother of 50 Cent, was born in New York. Sabrina became a big time drug dealer in Queens. 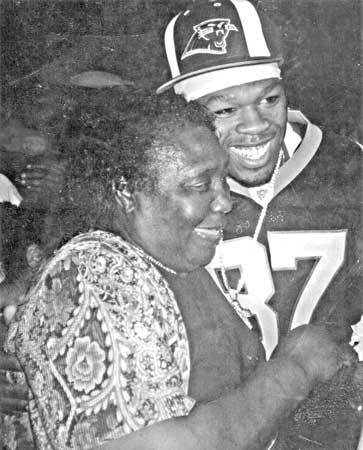 She gave birth to Curtis Jackson, III, aka “50 Cent” (July 6, 1976) at the early age of 15. Sabrina was known as one of the most feared drug dealers in Queens at the time. She was mysteriously murdered at the age of 23 — believed to be drug related — at which time little Curtis, age 8, went to live with his grandparents. At the age of 12, Curtis (nicknamed Boo-Boo at the time), submitted to the drug dealing lifestyle and legacy of his mother. He was selling drugs on the streets which landed him in jail a few times, and prison in 1994. Curtis decided to leave the drug life behind after the birth of his son in 1997, at which time he changed his street name to 50 Cent, as a metaphor for change. He began producing rap songs, with some of his music making its way to underground mixed tapes. People on the streets were really feeling his music. His talent even caught the interest of Jam Master Jay, a member of Run DMC. Jay produced a demo of 50 Cent’s rhymes that led to a signing with Columbia Records in 1999. 50’s life seemed to be heading in the right direction, in spite of a shooting outside his grandmother’s home, which left him with nine bullet holes in his body. He miraculously survived the gunshots and went on to become one of the richest hip hop performers, grossing $440 million in 2008, and to be ranked as the sixth best artist of the 2000-2009 decade by Billboard Magazine. David Kamp, Vanity Fair writer, began his search into 50 Cent’s ancestors with a slave named Jane, who is the great-great-grandmother of the popular rapper. Jane appeared in the 1870 federal census right here in Edgefield, as a servant at a house on Buncombe St., Carroll Hill, in the village of Edgefield. At the time of the census she had two children listed; one named Peter, who is 50 Cent’s great-grandfather. This was the first census after slavery ended which included a first and last name for African-Americans. In researching where Jane came from prior to the 1870 census, Kamp obtained copies of records from Tricia Glenn at the Edgefield County Archives, which strongly indicated that Jane was a slave of Whitfield Brooks. General R.G.M. Dunovant married Whitfield Brooks’ daughter Ellen on May 21, 1898. Both Dunovant and his wife Ellen are listed in the 1870 census along with Jane as a servant at the Carroll Hill residence. David Kamp, contributing editor for Vanity Fair, in conjunction with VH1 Television, will be filming Curtis “50 Cent” Jackson in Johnston and Edgefield within the next few months. 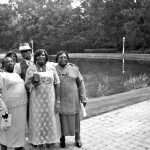 50 Cent, a family man, paid for his Johnston relatives to join him at a family reunion in New York, where this photo was made. 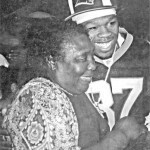 50 Cent is shown with his great-aunt Betty Washington off Johnston.